** CALL FOR MORE DETAIL & INFORMATION ** Sui U Machinery & Tools ( 002632381-M) GST No: 000442085376 No.22 Jalan 9/23A Medan Makmur Off Jalan Usahawan Setapak 53200 Kuala Lumpur. 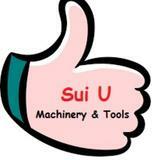 Call/SMS/Whatapps: 010-203 6363 Tel: 03-6735 8283 Email : sui.umachinerytools@gmail.com Thanks for viewing our ads.We assured the best quality and services. Any inquiry, do not hesitated to call or email us.